I joined this site four years ago and I just want to say THANKS for your kindness and great worksheets! This can be used as speaking cards to practise oral skills. I use these 40 questions to test my students at the end of a term. Topics: school life, free time, books, healthy habits and clothes. Level: 3º/4º ESO ( Spain ). Five cards plus a guide for students. Reading worksheet. A) Reading comprehension. B)Vocabulary activity on the Net. C) Adverbs of manner chart D) Sentence completion.Key on page 4. In Spain 4º ESO. A reading text plus five activities ( before and after reading ), vocabulary and writing. Main topic: jobs . It can be used with 4th ESO. Template by Mena. Text by Burlington Books. Thanks. Second set. This ws can be used as speaking cards to practise oral skills. 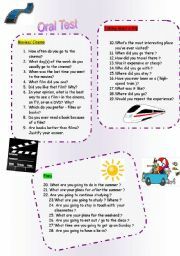 I use these 37 questions to test my students at the end of a term. Topics: movies, trips ( and transport ), plans and shopping. Level: 3º/4º ESO ( Spain ). Four cards plus a guide for students. Thank U 4 your nice comments!! This is another activity I prepared on the topic Internet and teenagers. It´s the 2nd of the set ( yesterday´s reading at http://www.eslprintables.com/printable.asp?id=515145#thetop ). I can send you the audio file via email. Key included. Hope you find it useful. Third set. This ws can be used as speaking cards to practise oral skills. I use these questions to test my students before Xmas break. 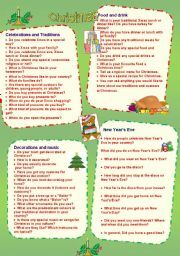 Topics: Christmas traditions, food, New Year´s Eve. Level: 3º/4º ESO ( Spain ). Four cards fully editable. Hope U enjoy it. This is the exam I´m using to test my students (12 years old ) next week. 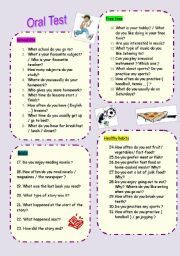 It includes grammar ( main tenses... ), vocabulary, reading and writing.Ten questions in total. I use Macmillan Secondary Course 1 at school. This is another worksheet I prepared on the topic Internet and teenagers. It´s the third of the set ( I uploaded a reading yesterday ). Page 1: writing practice. Page 2: two sets of questions related to the Net and social networking. Hope you find it useful. 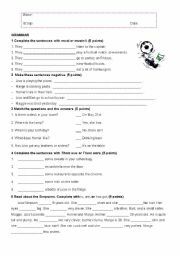 This is the test I´m using to test my students (13-14 years old ) next week.It includes grammar ( main tenses... ), vocabulary and short reading. Ten questions in total. I use Macmillan Secondary Course 2 at school. 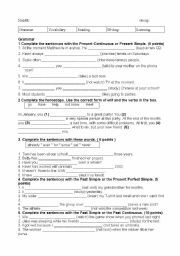 This is the test I´m using to test my students (15 years old ) next week.It includes grammar ( main tenses... ), vocabulary, reading, writing and listening. I use Macmillan Secondary Course 3 at school. The aim is to give basic info about this city: transport, main sights, royal family and a final activity. Gabi, thank U for your advice. This is the second part of my ppt. It includes info about pubs, shops, Notting Hill Carnival and a final activity. Enjoy!! This ppt includes info about Ireland: facts, symbols, sights, links to websites. A final activity to test students´ memory. Enjoy your trip!! This is the second part of my ppt. It includes info about St. Patrick and more. Also, a final activity to test students´memory. Enjoy!! An easy way to introduce/revise simple past. It includes a true/false exercise. This powerpoint is not on clothes but on ADJECTIVES to describe them. I used this powerpoint with my 3rd ESO students. They worked in groups and made this great "glossary". A different way to revise jobs. It includes words like conductor, magician, wrestler, etc. ( not the usual jobs )My students chose and made the slides. Sorry I had to divide the powerpoint. A different way to revise jobs. It includes words like conductor, magician, wrestler, etc. ( not the usual jobs )My students chose and made the slides. Contrast: past simple or continuous ? 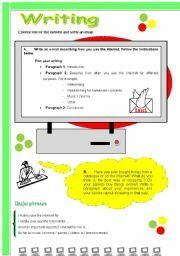 A powerpoint to introduce/revise the main points with past continuous: use, spelling, formation plus contrast with past simple. It includes exercise with key.